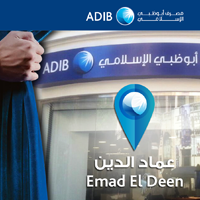 In light of our continuous Efforts to provide customers with the best banking services and experience and as part of our branch relocation plan that started in 2015 to solidify our presence in Egypt to provide more accessibility to our customers , we are proud to announce the opening of our new branch in Emad El Din – Down Town. Cairo, 8 May, 2017 – Abu Dhabi Islamic Bank - Egypt (ADIB-Egypt) is proud to support Egyptian government – represented by the Central Bank of Egypt (CBE) – financial inclusion efforts, reaching out to underserved segments of society and allowing them access to all the benefits they can gain by being integrated in the country’s banking system. As part of the Financial Inclusion Week running from 27 April to 4 May, 2017, ADIB-Egypt is offering individuals the opportunity to open accounts free of charge and administrative fees and with no minimum balance requirement throughout the week. Cairo, 15 February 2017 – ADIB-Capital – Abu Dhabi Islamic Bank-Egypt’s investment banking arm - has received International Finance News’ “Mudarabah Deal of the Year” award for the Egyptian Electricity Transmission Company EGP 2 bn transaction.